FOR IMMEDIATE RELEASE—May 2, 2012– Binghamton, New York–SunMaxx Solar, a leading integrated manufacturer of solar thermal systems and components, is pleased to announce that the SRCC (Solar Rating Certification Corporation) has completed testing of the company’s ThermoPower UDF10, UDF20 and UDF30 collectors, which are now fully SRCC certified. The SRCC certification for SunMaxx Solar UDF collectors ensures that solar thermal systems using these collectors now qualify for incentives and rebates that can help the customer pay the initial cost of a solar hot water system. 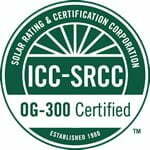 SRCC Certification also provides a way of measuring the performance and cost-value of SunMaxx ThermoPower collectors against the same size collectors from leading competitors, proving that SunMaxx delivers a highly efficient solar solution suitable for diverse weather conditions and offering superior performance over the leading competitors. SunMaxx is a leader in renewable energy manufacturing and distribution, offering more SRCC certified system options in the U.S. and abroad.